Parade onlookers wave to Gallia County veterans as they pass by on Second Avenue to commemorate the struggles of Vietnam War veterans in a past parade. Gallipolis VFW Post 4464 Commander Bill Mangus salutes onlookers while Chaplain John Jackson rides as a passenger. 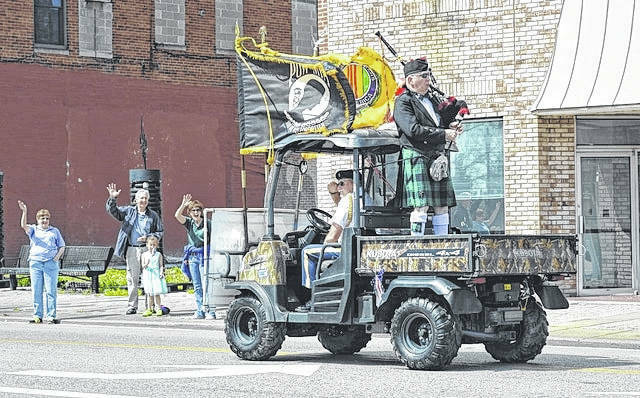 William Holmes Jr. plays bagpipes in the ATV bed. GALLIA COUNTY — With the approach of Veterans Day on Nov. 11, area organizations are preparing to honor the area’s heroes with both a parade and a variety of other events. The Veterans Day Parade and Ceremony for Gallipolis will be held Saturday, Nov. 11, organized by the Gallia Veterans Service Commission. All veterans, veterans service groups and community organizations are encouraged to participate. The Veterans Day Parade and Ceremony is to honor military veterans and demonstrate community support for their service and sacrifice. The parade will begin at 10:30 a.m. and end at Gallipolis City Park with the ceremony beginning at 11 a.m. Contact the Gallia Veterans Service Office at 740-446-2005 no later than Nov. 9 to confirm participation in the parade. The speaker for the official City Park Veterans Day event has not been announced as of this time. Area veterans are being honored at the Gallipolis Walmart at 10 a.m. with Gallipolis Municipal Judge Eric Mulford speaking on Nov. 4. Area veteran associations will be present to take part in the event along with Gallia Academy musical groups. The public is welcome. A letter will be read from U.S. Senator Joe Manchin from West Virginia. The eighth grade class and staff at River Valley Middle School will hold a Veterans Day Community Celebration on Nov. 10. The school invites all veterans to come to the assembly and join the celebration to honor the nation’s heroes. The assembly begins at 10 a.m. at River Valley Middle School. According to VFW Post 4464 Post Commander Bill Mangus, another event to honor veterans will be held by Ohio Valley Bank in the Bossard Memorial Library Riverside Room at 10 a.m. Nov. 15. Retired Major General Edward Mechenbier of the US Air Force will serve as the keynote speaker for the event. Mechenbier is a West Virginia native from Morgantown. He served in the military between 1964 to 2004. If you are hosting any additional Veterans Day events you would like published, send to GDTNews@aimmediamidwest.com.